A certain gene in Barbra Streisand's DNA must also be present in Toni Gonzaga's. Since I saw Toni present a show on TV, I was already sure she is the next Kris Aquino, perhaps a better one. On top of that, she reigns as a movie queen, sings like a top performer, and moves products just with the sheer force of her charisma- the exact resemblance of my idol Barbra. Fresh off the top-grossing success of Starting Over Again with Piolo Pascual, Toni is paired anew with John Lloyd Cruz in Home Sweetie Home on ABS-CBN. She recently released her sixth studio album, Celestine, while her same-titled concert is set to kick off in October. She also co-hosts with her real-life sister, Alex Gonzaga, a mobile series entitled Team Gonzaga, which can be exclusively viewed on ABS-CBN mobile. She is seen regularly on The Buzz, ASAP, The Voice of the Philippines, and Pinoy Big Brother: All-In. To say that Toni is busy is an understatement. And she is just 30. “I think now that I’ve reached this age and after everything that I’ve been through in this industry, I just really feel that everything that has happened to me has been God’s grace. I don’t really want to take credit for everything that I did in the past because I feel like I don’t own any of this. Everything is just given to me and anytime, God can take it all away and that’s why I’m making the most out of it and giving it my all, making it like it’s my last every time I’m given an opportunity,” said the winsome celebrity. With Pinoy Big Brother: All-In wrapped up, her hectic schedule has become more bearable. “I guess everything is just time management. I’m really thankful for my staffs who really know how to manage my time. It also helps that I don’t have any vices. I’m a homebody. I don’t really like to go out that much. Whenever I’m given a free time or free day, I just stay home and rest,” stated Toni. Toni still stays with her parents but when she’s away from home for work, she stays in touch with them every so often. “We get connected every day through texting and calling -- updating each other with what’s happening with my sister Alex now that she’s also busy with her career and is getting all these great opportunities and breaks,” shared Toni. “So we don’t really get to see each other that much and spend a lot of time together that’s why we get updated through calls and texts and sometimes MMS when want to ask something for advice or if we want to buy something for each other,” she continued. With the kind of lifestyle that she lives and with the busy schedule that she has, it is very important for Toni to have a gadget that she can really rely and depend on. She found that in Acer, which recently awarded her as the Brand Ambassador for the Philippines. “I think there really wasn’t that much convincing to do. As soon as I was asked—it was my Mom who told me that Acer was interested to get me as their ambassador, I didn’t have any second thoughts. I said yes right away. I think for as long as I can remember, I was still in high school or college days, I already knew about the brand and I grew up seeing the brand in my Mom’s office. So, I was already familiar with the brand. It’s an established brand and has been there in the market. A lot of companies trust Acer, so I know I’m going to be in good hands because I believe in the product. I trust the product. And I know it’s worth something that I’m proud to be a part of,” revealed Toni. Manuel Wong, General Manager of Acer Philippines, need not explain why the TV personality is the perfect choice for the post. “Toni is the perfect brand ambassador for our target market, which is the young and mobile. She is not just a beauty but she has talent. Everyone knows that she can sing and she can dance, but more importantly, she is a very religious person and family-oriented. With these qualities, I believe that we made a good choice,” said Wong. Indeed, it’s one blessing after another for showbiz’s hardest-working woman. “I’m very grateful and it’s such an honor to represent a brand I trust and I believe in. We have one goal and that is to encourage a lot of people that they don’t have to buy expensive gadgets to live a convenient and comfortable life for as long as you know that there’s a brand that you can trust and which can give you the same quality that other products offer at a very affordable price, especially with how our life is now. It’s important to be practical and trust a brand that’s been in the market for many, many years,” expresed Toni. Keep in touch with Acer, like www.facebook.com/AcerPH and follow twitter.com/acerphils. Explore Worldwide. 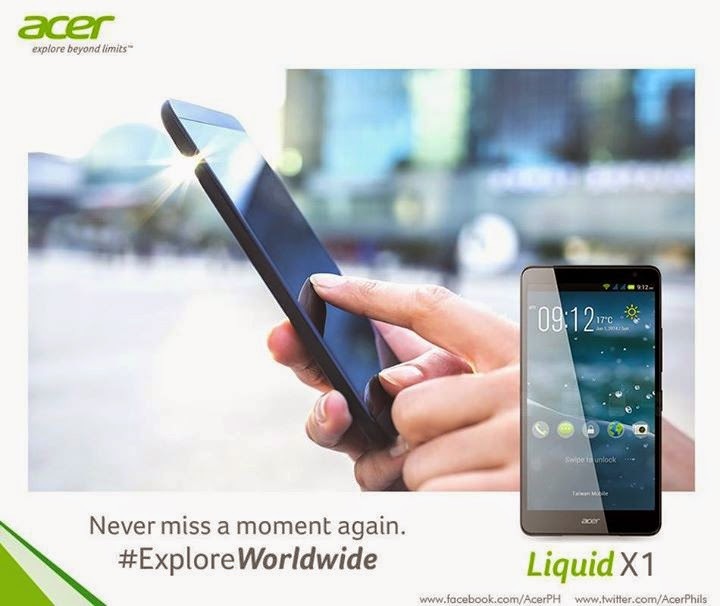 Visit www.acer.com.ph to get a list of all available Acer products including Liquid X1.